With all the soup-making going on around here, it's the perfect time for this recipe. I think biscuits are my favorite soup go-with, and these are awesome. I already have a buttermilk biscuit recipe that I like a lot, and although I didn't feel a great need for a better one, I do have a lot of cookbooks. Reading all these books inevitably leads me to try out recipes that involve an interesting technique or different ingredient. In this case, I wanted to try out a biscuit made with shortening instead of all butter. Not only is shortening (or often lard) a very traditional ingredient in Southern baking, but it also has less saturated fat than butter (at least Crisco does). For me, fat content was not the issue--I just wanted to see what I might be missing out on in the universe of biscuits. I prefer these biscuits to my all-butter version. I still used butter (4 tablespoons), as well as 3 tablespoons of Crisco. I think this effected the texture and structure for the better. However, I also used half whole wheat pastry flour and half all-purpose. In the past I've stuck to 100% AP. I think the whole wheat pastry gave the biscuits a tangible sweetness without adding "wheaty" flavor. I loved the finished product and plan to make it this way from now on. And finally, to gild the lily, I baked these to eat with leftover Christmas ham and pear chutney. The ham biscuit can be made with something sweet like chutney (or fig jam), mustard, cheese, whatever you want. Or just plain. But it's the ultimate way to use up leftover ham. My recipe for pear chutney follows the biscuits! One more thing: I also made a fantastic biscuit variation with Feta cheese and scallions that I included below. In fact, those are the ones we ate with that amazing chestnut, celery root and pear soup. 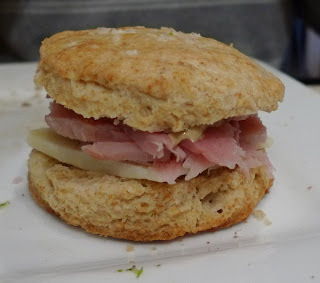 Perfect for ham biscuits with pear chutney. Slightly adapted from the Gourmet cookbook. Variation: replace shortening with 3 ounces chopped Feta cheese and 3 chopped scallions, plus generous freshly ground black pepper (whisk with dry ingredients). I used all whole wheat pastry flour for this version. Preheat oven to 425 F and line a baking sheet with parchment paper. In a large bowl, whisk together the flours, baking powder, baking soda and salt. Add the butter and toss with the flour mixture a couple times. Break the shortening into small chunks and add to bowl. With a pastry blender or your fingers, blend until you have a shaggy mixture with some pea-sized chunks of fat remaining. Add buttermilk and stir just until flour is moistened (dough will not come together into a ball yet). Turn dough out onto a lightly floured work surface. Flour your hands and quickly knead dough into a ball and press into a thick disk. Lightly flour dough and roll out to a generous 3/4-inch thickness. With a 3-inch cutter, stamp out biscuits, dipping cutter into flour before each use; do not twist cutter. Transfer biscuits to baking sheet. Quickly re-roll remaining dough and make as many more biscuits as you can (you'll get about 8). Lightly brush tops of biscuits with buttermilk and sprinkle with flaky sea salt. Bake 14 minutes, or until bottoms are golden brown and a toothpick comes out clean. Serve immediately. This recipe is not meant for canning. It keeps in the refrigerator for about 1 week. Combine all ingredients in a large saucepan and cook over medium heat, stirring occasionally until mixture stars to bubble. When liquid has reduced a bit, turn heat to medium-low and cover. Cook, stirring occasionally until pears are very soft, about 30 minutes total (cooking time will vary depending on how ripe the fruit is). If too much liquid remains, simmer uncovered until you reach the desired consistency. Cool in pan, then transfer to an airtight container and chill. Beautiful biscuits. I have never baked them at home. Must try it sometime! That looks delicious! I love the idea of using Feta...it's one of my favorite cheeses.